The West Everton Community Council (WECC) and One World Week alongside The Craftivist Collective is taking part in the Liverpool Bluecoat Bed-In to celebrate John Lennon’s 70th birthday. The Bluecoat event takes part from October 6 – December 9, 2010: our Bed-In is on December 1, 2010. During our Bed-In we want to raise awareness of global issues in our own community and amongst the people of Merseyside. We may represent a specific community but we come with our global concerns to a bed in the Bluecoat. We want to raise awareness of national and international inequality and demand change – we want to see an end to the social chasm between those who have and those who need. Ours is a peaceful protest that wishes to engage all people in crafty action: Craftivism! We will make lovely stuff and change the world by stealth and beauty. Full project details after the jump. We think that “all you need is love” but unless you make an effort to share it out equally some people get more love than others. We want to demonstrate something of our love for the community we live in, the city we have been online pharmacy reviews brought up with and the world that embraces us. We believe that that only way we can do this is to demand equality, justice and peace. We will be engaging in craftivism activities in bed. We will sew and stitch our way to peace. Before the bed-in we will offer fabric 6″ x 6″ pieces of fabric if needed to anyone who is prepared to stitch for us – we aim to gather stitchers from across the globe. These patches will be completed and put together to form a massive protest duvet during the bed-in. This duvet will then be filled with white feathers to symbolise our hope for peace. We need people to film themselves in bed making the patch and talking about it, take a photo of you doing it (like the poster we made) – and/or write a blogpost about your patch. 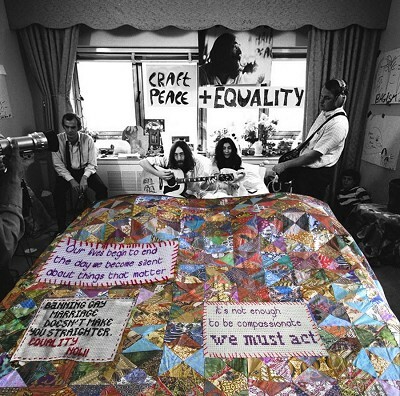 We are trying to get people making patches all over the world so the patchwork duvet set is literally made all over the world as a glocal effort (global and local) and to show how inequality in all forms causes conflict (people fighting for water because of climate change, gang warfare because of lack of power, land rights issues, discrimination of homosexuals etc) as well as hopeful quotes/slogans/facts on peace and equality. For more information, please take a look at our Facebook event.